With a roster of mostly sophomores, Blanchet Catholic wasn’t supposed to win a state championship. But its road to a title didn’t begin two years ago. 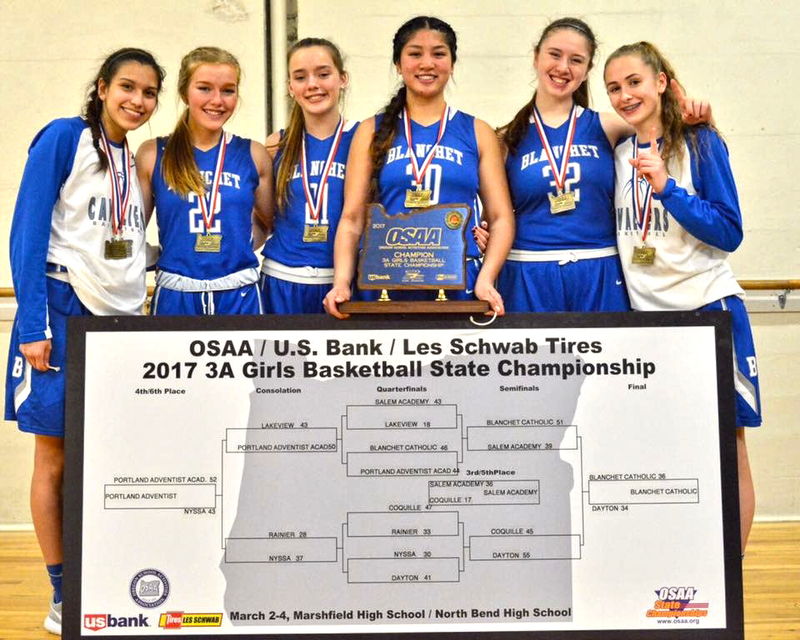 It started when five future Lady Cavaliers—Ana Coronado, Bailey Hittner, Hailey Ostby, Lauren Elmore and Trinity Phipps—came together as fifth graders on the same tournament team in the Keizer Youth Basketball Association. That squad, which won a state middle school championship as sixth graders, was coached by Bailey’s father Ron Hittner, who was an assistant at Corban University and is now the head coach at Blanchet. Kalea Salang joined the girls at KYBA in the eighth grade. With all six girls on the varsity team as freshmen, Blanchet made the 3A state tournament last season for the first time since 2012 but were eliminated in the first round. With the goal of getting back to the playoffs and this time winning, the fifth seeded Cavs easily defeated Amity 51-29 in the first round to advance to the state quarterfinals at Marshfield High School in Coos Bay. They then edged No. 4 Portland Adventist 46-44 to play PacWest Conference foe and No. 1 Salem Academy in the semifinals. Blanchet had defeated the Crusaders by two points early in the season but had since lost twice by an average of 10.5 points. The Cavs evened the score in the semifinals, winning 51-39 to advance to the state championship game for the first time in school history. “The kids did a great job executing the game plan,” coach Hittner said. Up next was two-time defending state champion Dayton, who Blanchet had narrowly lost to back in December. But the Cavs fell behind by 14 points early in the fourth quarter. Needing a miraculous comeback, the girls went to a defensive drill they’ve practiced since the fifth grade. The objective is to play defense for an entire minute without making a mistake. Blanchet did it for seven minutes, holding Dayton without a basket while scoring 16 straight points. Coronado capped off the run by stealing the ball from two-time 3A player of the year Shawnie Spink and making a layup on the other end to give the Cavs a lead with 30 seconds remaining. “I wasn’t expecting myself to steal the ball but it was out there so I took it,” said Coronado, who led Blanchet with 13 points, nine rebounds and four steals in the 36-34 state championship victory on Saturday, March 4. Blanchet, which prides itself on playing full court pressure defense, simply wore Dayton down. The Cavs also fed off the crowd. “The atmosphere was electric,” coach Hittner said. Once the final buzzer sounded, the girls couldn’t hold back the tears. Bailey, who’s been coached by her dad since she began playing basketball in the third grade at KYBA, said her favorite moment was watching him cut down the net. After a snow day, the team, which also includes Sophia Poole, Wendy Liao, Emily Collier, Najma Suri, Sierra Archer and Katey Moore, were honored at a school assembly. Batting leadoff, Nadia Witt said she was just trying to get on base. 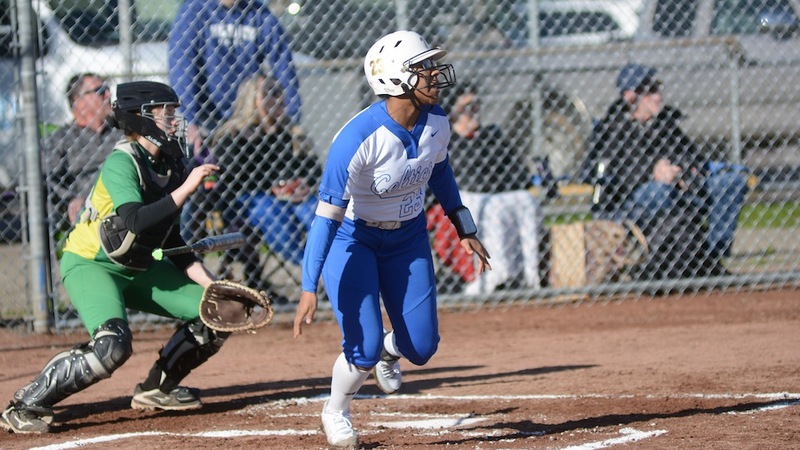 The McNary center fielder did more than that, going 3-for-3 with two doubles and two runs scored as the Lady Celts shut out Cleveland 10-0 on Thursday, March 16 to open the 2017 softball season. McNary sophomore Faith Danner pitched all five innings, recording six strikeouts and no walks. She allowed seven hits but only four got out of the infield. Freshman outfielder Alexa Cepeda, who hit second in the Lady Celts lineup, claimed she was nervous before her first high school game. But it didn’t show as Cepeda went 2-for-3 with a pair of doubles and two RBI. Witt and Cepeda’s bats sparked McNary early. After Witt doubled to leadoff the bottom of the first inning, Cepeda roped a double of her own down the third base line to knock in Witt for the Lady Celts first run of the season. With two outs in the bottom of the second, Witt and Cepeda did the same and their back-to-back doubles gave McNary a 5-0 lead. First baseman Haley Ebner singled to bring home Cepeda to give the Lady Celts a 6-0 lead after two innings. McNary added four more runs in the third. Danner was 2-for-2 with a walk while courtesy runner Sabello Alfaro scored two runs. Emma Kinler and Nicole Duran both had RBI singles. Freshmen Kendyl Jennings and Haley Bingenheimer both had a hit and scored a run in their first game. 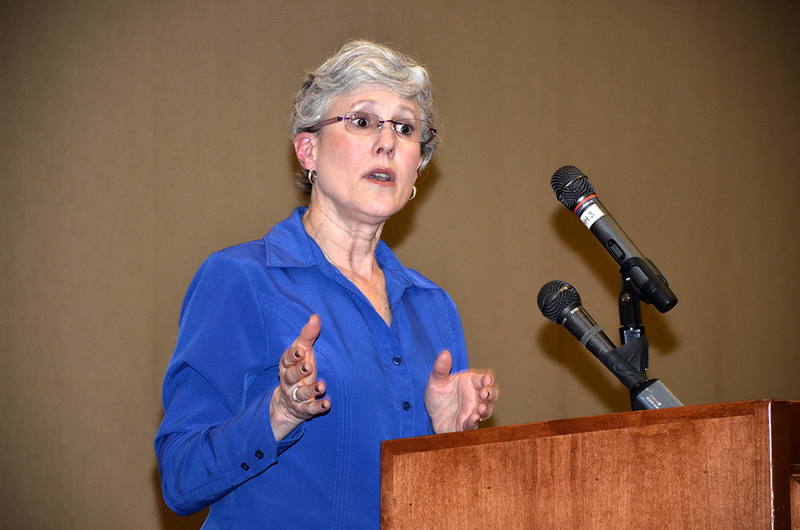 Keizer Mayor Cathy Clark delivered a largely upbeat message in her annual state of the city address delivered to a gathering of Keizer Chamber of Commerce members Tuesday, March 14. Clark said the city survived the bursting of the housing bubble mostly unscathed, but now faces a housing shortage. “We still need 214 acres beyond the current urban growth boundary to meet the current needs of the population,” said Clark in a nod to continuing discussions about expanding the urban growth boundary that keeps Salem and Keizer within a confined space. Clark also addressed the issue of homelessness early in the speech. 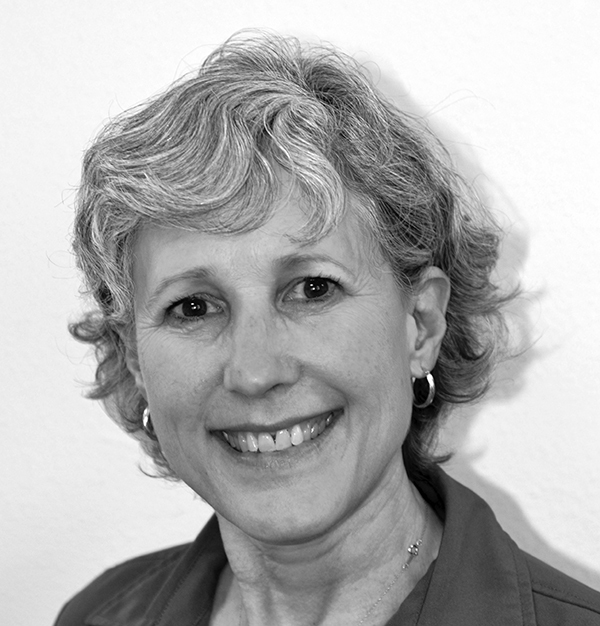 She was part of a task force that spent a year looking at the issues around homelessness in the region and is now working toward implementing the recommendations that resulted from the process. “We have a rising homeless problem and we don’t have the services and support and safe, secure shelter for them. I want to be clear that the people are not the problem, it’s about our ability to take care of the people that we are facing,” Clark said. She lauded the efforts of Salem’s Union Gospel Mission and Habitat for Humanity in serving the vulnerable population. Clark spent several minutes praising the local business community and suggested a revitalized economic development effort was in the offing. “You bring your A-game everyday and that is the heart of the Keizer business community,” Clark said. At the city government level, there are no staff members tasked directly with economic development. A city task force was convened to discuss a way forward, but meetings have been intermittent at best. “I am working with Councilor Bruce Anderson and, together, we are going to be looking at how to redefine the committee to partner with local business to plot the course forward,” she said. She encouraged the representatives of local businesses in attendance to find ways to get involved at McNary High School and help students discover how to continue their journey after receiving a high school diploma. “If a student takes one career technical education class, the graduation rate jumps to 88 percent. The diploma is no longer the end game for them. Mentoring those students is critical. The opportunities for them open up in business and life when someone comes up to them and speaks to their potential. That goes a very, very long way,” Clark said. If there were any hidden asterisks attached to the Keizer way working, they were reserved for the end of the speech when Clark addressed the state of funding for parks and police. The Keizer City Council has identified both as needs for the city, but one of the only ways to create sustainable dedicated funds is through the creation of fees. That leaves some residents with a bad taste in their mouth. “We chose Keizer because it works. But, it’s old enough to begin replacing and maintain the things we built, and do so in a sustainable way,” Clark said. 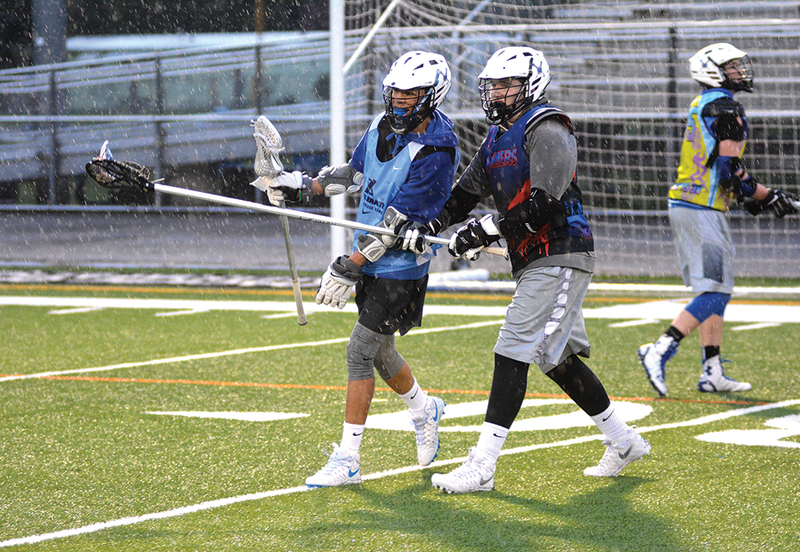 Led by a strong junior class, McNary lacrosse coach Ryan Bowlby expects a solid season. The Celtics opened the 2017 campaign on Monday, March. 13 with a 12-8 win at Newberg. McNary’s first home game is Friday, March. 17 versus Hermiston at 7 p.m.
Jonathan Williams, who scored three goals and added three assists against Newberg, will lead the offense. “Right now pretty much everything is ran through Jonathan Williams,” Bowlby said. “He’s a super athlete. He’s running track this year and doing lacrosse. Williams wasn’t happy with how he started his junior season. One of those players is another junior, Chad Pinney, who has played midfield the past two seasons but is transitioning to attack and scored three goals at Newberg. Marcus McCoy returns at goalkeeper where he was an all-league honorable mention as a freshmen and Second Team selection as a sophomore. As a junior, McCoy is ready to take on a more leadership role. Is there someone you think should not be able to see a doctor? The new proposal hopes to improve access with the exception of 45 million or so (American exceptionalism? ), who can’t or won’t afford it. It is a question we must answer according to our humanity rather than political affiliation, ideology, or income level. We need to ask instead how we’ve decided that some Americans don’t deserve health care. Now there is a push to repeal the Affordable Care Act and put in place a system that would reduce the number of insured by 24 million and increase premiums by 15-20 percent in 2018-2019. The selling point is a reduction of $337 billion in costs over 10 years, that reduction delivered by less “customers” served, paying higher premiums. He neglected to mention for whom tax relief is massive, or that the deficit is reduced in proportion to the numbers of Americans denied health care. Many of the 24 million no longer insured will be those simply willing to gamble on their continued good health, or no longer able to afford the increased premiums. They are free to make that decision because there is no longer a penalty for going without coverage. With fewer young, healthy enrollees, insurance companies may be less willing to offer coverage plans if the sick and the elderly are not seen as a profitable customer base. The idea that competition will lower costs and provide better plans seems patently silly. Instead it has given us the $650 Epipen and Martin Shkreli, who raised the price of Daraprim from $13.50 to $750.00 overnight. Leaving health care to the tender mercies of insurance companies and the pharmaceutical industry has given us the highest per capita costs in the world. This is our decision to make: Should American health care policy be designed for the benefit of the sick and injured or the benefit of for-profit providers? Medical care has been around since biblical times. Is it now a business opportunity? Though we allow it a major stake in our decisions, health insurance as a for-profit industry hardly even existed before World War II. One of its principal effects has been to drive low income Americans to the very costly services of hospital emergency rooms. Is there no more humane way to provide health care for all? The city has received numerous complaints about the high school traffic and parking on and around McNary High School. The safety and livability for people living in our neighborhoods and the safety and access for our Keizer students to get to school are very important to us. In order to let people know what is going on, I felt it would help to write an open letter and share the issues and options we are facing. Students are having more difficulty getting safely to McNary High School. All the entrances are crowded as the more than 2200 students plus staff members converge on the school. Parents have contacted the Traffic Safety Commission and me about making it safer for students to walk, bike or drive. And residents living in areas around the school have faced problems over the years from littering to drugs. The Salem Keizer School District is aware of the problems and our city manager and police staff have been working with the district regarding school overcrowding and the neighborhood impacts. Until the school and its parking are expanded, we are committed to work with their administration to help solve issues as they arise. Recently, the majority of issues have been centered on Newberg Drive. Some we have been able to resolve quickly because the city has the authority to take action. Some are more complicated and require coordination with the school or neighbors. And some problems are directly connected to the overcrowding, so the city is actively participating in the site planning process with the district. Cars were parked in muddy gravel areas around a house near the school. It turned out not to belong to a resident but was public right of way so the city did appropriate maintenance to take care of the mud. Parking by the fire hydrant: The curb has been painted to clearly mark the no-parking zone around the fire hydrant which makes it an enforceable violation to park there. Littering: School staff, students, including student leadership and some of the neighbors have been keeping the trash picked up on a regular basis. I agree with everyone’s frustration with trash – the mere idea of being so self-absorbed that one does not put trash into appropriate bins is beyond my comprehension. And we all appreciate people who volunteer to clean up and take pride in our community. A resident raised the issue of towing cars that are blocking driveways and as a result, we found an inadvertent change in our ordinances in the 90’s that is now being corrected to give our police the authority to call for towing in that situation. Blocked driveways have been an issue, particularly for one neighbor who has been blocked in and was written up for being late to work. With Newberg Drive being an unimproved street, some driveways are not clearly defined. We can work on ways to clearly and consistently mark the driveways. That would provide objective, enforceable spaces for no parking. I am asking our Community Development Department to bring information on options to both Traffic Bike Pedestrian and Planning Commissions. Their recommendations will then be provided to residents who have driveways that are not clearly defined. Newberg Drive is dark. Keizer neighborhoods are each covered by their own street lighting district paid for by the residents. Older neighborhoods like Newberg Drive were built without them, but may at any time establish a street lighting Local Improvement District to install lights and pay for their operation each year. Those of us who live in neighborhoods that have street lights are willing to do so because we value the safety and security they provide. I encourage residents on Newberg and throughout Keizer to all seriously consider putting in street lights if you don’t have them. Newberg Drive also has no sidewalks. We have a long list of sidewalk projects to build and are getting projects built each year as funds allow. In the meantime, neighborhoods may form a local improvement district program to build sidewalks. The LID allows those costs to be paid back over 20 years or upon sale of the property. Information on sidewalk LID is available from the Community Development Department. Before school, there is noise and traffic clogging Newberg. According to the Chief, police have been monitoring the area regularly. He explained that traffic congestion is not generally a ticketable offense. The city paid for the traffic signal at Chemawa, which helped ease problems there. Our police department does not have the staffing capacity to monitor the three high school entrances plus the two middle schools and about nine elementary schools; Gubser Elementary has a similar problem to the congestion on Newberg. We have been strongly urging the school district to come up with a short term plan for more parking while preparing for site upgrades in the future. And there are some issues or concepts that have been proposed which may work but are not as simple as they seem. Opening another gate at the end of Orchard Street would ease congestion with an additional access point. But students would be walking straight right into traffic on Celtic Way. The future site plan could add sidewalks and realign the roadway, but it is not safe to do currently. A “No McNary Parking” zone has been repeatedly proposed as a simple solution to the problem. It is true that the signs are cheap and easy to put up. However, as our city staff has explained several times, the signs alone do not provide enforceable violations that will stand up in court, and the signs inconsistently deny people the use of a public right way. The street belongs to the people of Keizer. Parking in front of a person’s home is not reserved space. We can ask students to not park there. We can ask people attending sporting events to not park there. But it is a public right of way and we cannot legally deny people the right to use it. Other jurisdictions that have tried voluntary compliance have all had to go to an enforceable program. Another option our staff proposed is limited time parking, such as a three hour limit during the day. But, again, this would have to apply to ALL vehicles, as the residential and non-residential vehicles would not be distinguishable without a permit. When there is a need established to restrict public parking on public streets, cities across the country have developed residential parking zones. The program like the one in Salem for areas around North Salem and South Salem High Schools has provided clear vehicle identification, parking preference on public streets for residents, and is legally enforceable. See this link (www.cityofsalem.net/residents/parkingservices/documents/residentialpermit.pdf) to show how those zones are established and the program for residents to purchase parking permits. In order to reserve public right of way as parking for residents, there is a cost to establish and enforce the program. We do not have such a program in place, but I am forwarding this information to the Planning Commission and Traffic Bike Pedestrian Commission to consider the matter. If such a program is established, guidelines and costs would be established for designating residential parking zones. The city staff and Council know that school overcrowding has led to safety and livability problems for students, residents and families. I am committed to working with you all to achieve effective and equitable solutions.